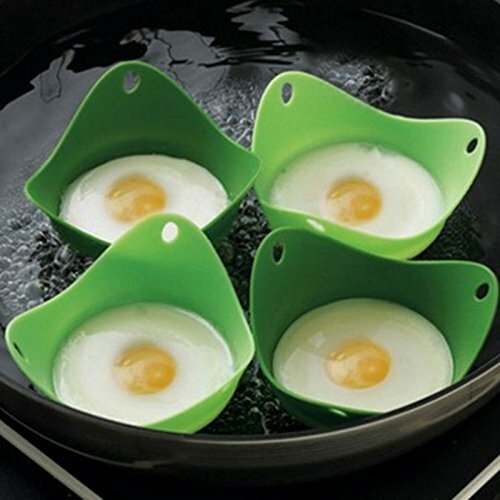 Home › Home and Kitchen › Cojoy Silicone Egg Poachers Egg Cookware Cups Silicone Poach Pods Built With ..
Cojoy Silicone Egg Poachers Egg Cookware Cups Silicone Poach Pods Built With .. SAFE AND ECO-FRIENDLY; made with food grade, BPA Free and 100% FDA Approved silicone for both your safety and reusability that's friendly to the environment. Color: Blue Use Steps: 1) Boil water in a saucepan 2) Spray or brush the inside of pods with nonstick spray or olive oil. 3) Crack the eggs and place into the pods. 4) Turn down the water to simmer. 5) Place the eggpods into the water. 6) Replace the pot cover. 7) Wait til your eggs are as you want them (up to 5 minutes) 6) Carefully take the pods out of the water. 7) Invert the pods over your plate, the eggs will slide out of the pods.